The three species of elephants are the largest land mammals on Earth. Asiatic elephants (Elephas maximus) live in India, Nepal and Southeast Asia, while African bush elephants (Loxodonta africana) and African forest elephants (Loxodonta cycloris) live in sub-Saharan Africa. Elephants form herds with complex social networks and hierarchies. These intelligent and empathetic animals form close bonds with members of their herd and have developed many ways to communicate affection and support for one another. Elephants use their trunks much like people use their hands, and the ends of their trunks are more sensitive than human fingertips. Trunks have as many as 100,000 different muscles and play a central role in the animals' communication with each other. Elephants stroke or caress each others' heads and backs with their trunks to console or comfort loved ones. Calves place the tips of their trunks in their mothers' mouths for reassurance -- a gesture repeated by lower-ranking elephants in interactions with the herd's matriarch. 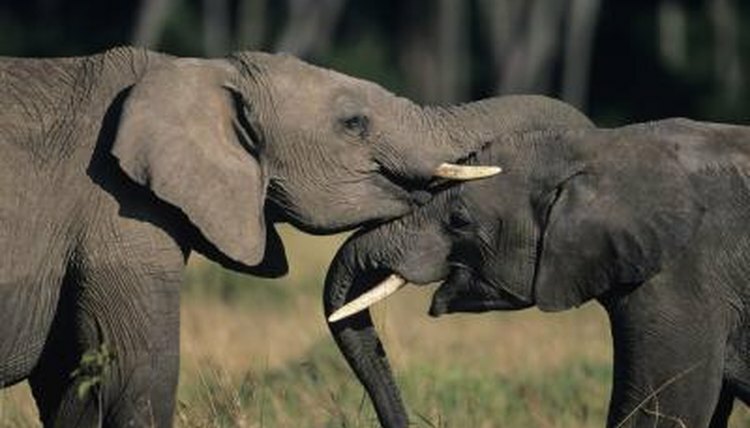 When engaging in courtship behavior, elephant couples engage in friendly trunk wrestling and entwine their trunks together. Elephants produce a variety of different sounds, some of which they use to express friendliness, love and affection. As mother elephants caress their calves, they often rumble in a soft, soothing manner. They also make a low noise that sounds somewhat like a cat's purr, expressing pleasure in their company with one another. Elephants' loud trumpets are perhaps their most famous vocalizations, often produced as a sign of excitement or alarm. However, they also trumpet to express happiness and joy, such as to celebrate the birth of a new baby. Elephants rely on touch and visual cues frequently to express emotions. Whether grazing or gathering around a water hole, family members are in near-constant contact, flapping ears and rubbing bodies together to show care and compassion for one another. When a herd member dies, elephants press together and console each other, grieving for the loss and touching the dead with their trunks and feet. They also have a number of playful, friendly gestures such as flapping ears or flicking tails that express their feelings of camaraderie with their family members. The bond between mothers and their calves is closer than any other in the herd. Mothers consistently touch their calves, whether taking their tails to guide them or running their trunks lovingly over their heads. Mothers and other herd members are quick to assist a baby or juvenile who's fallen down or gotten stuck. These protective behaviors and empathetic impulses extend beyond the mother-calf relationship to include other members of the herd as well. For example, if a herd member is injured, the rest of the herd may travel more slowly in solidarity so the injured animal isn't left behind. How Do Horses Show Affection to One Another? What Do Elephants Do for Fun? Do Zebras Have a Mating Ritual? How Many Calves Does an Elephant Have at Once?